The Kilauea volcano in Hawaii is not the only one people should be concerned about. 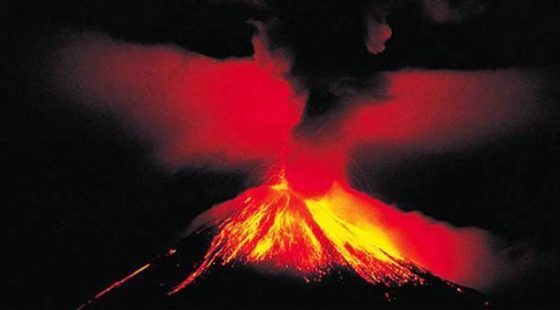 In fact, the volcano is in a long chain of 169 others and of those, 50 are poised to explode, said scientists. The United States Geological Survey (USGS) lists a total of 169 volatile volcanoes across the Western US, Hawaii, and Alaska. The US volcanoes have been active to varying degrees over the years but the ongoing eruption in Hawaii has reminded people of the unexpected dangers of mother nature; especially considering scientists say that at least 50 of the fiery mountains listed have been deemed by the USGS to be a “high priority” for the scientific monitoring for an eruption. According to the USGS, “volcanic unrest is persistent” in Alaska and Hawaii. The Hawaiian Islands are at the end of a chain of volcanoes that formed more than 70 million years ago. Mauna Loa, for example, the world’s largest active Hawaiian volcano and neighbor to Kilauea on Big Island, has erupted 33 times in the last 175 years. A yellow volcanic advisory for Mauna Loa has been in effect since April after a bout of tremors rocked deep underground beneath the volcano. Another Hawaiian threat comes from the subaquatic Loihi Seamount volcano, about 35 km (21.7 miles) southeast of the Big Island. That ancient volcano last erupted in 1996 with a swarm of 4,070 earthquakes – the highest number of Hawaiian earthquakes in history. In Alaska, Mount Cleveland has been in a state of volcanic unrest since 2015. In total, there are about 130 volcanoes throughout the remote US state and about 90 of them have been active in the past 10,00 years. In the mainland Unites States, Mount St. Helens and the Yellowstone supervolcano are among the most dangerous volcanic threats to the country. Another spectacular volcano is the impressive Lassen Peak, whose 1917 eruption shaped the landscape of Lassen Volcanic National Park in northern California. Next Next post: Why Is A Government Drone Flying Over A Sacramento Neighborhood?